I often get emails asking me questions about the business of blogging. I’m definitely not an expert on blogging but I have been at it for about three years now. I thought I might share with you some tips and trick, resources, and some simple steps that have really helped me along the way. When I first started blogging I remember spending HOURS upon hours googling, reading, and learning. It was so hard to find a bunch of information all in one place. Hopefully, this will be one tool that you can use to guide you in the beginning stages of blogging. 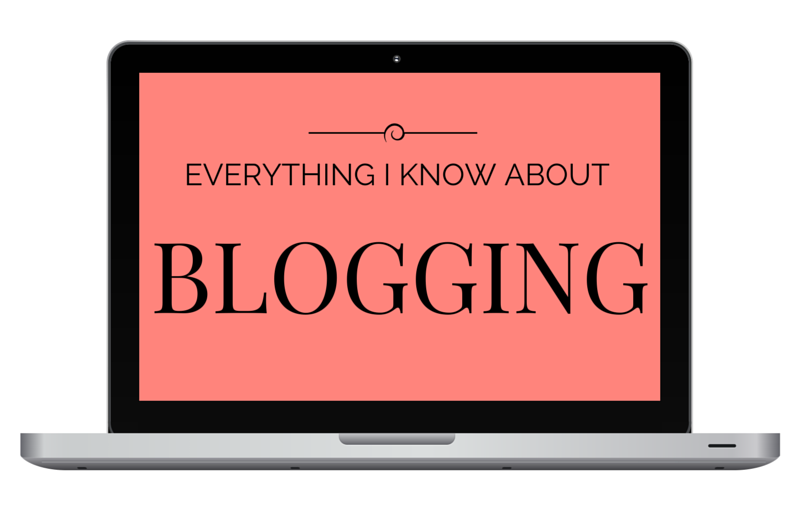 One thing about blogging though is that you never know everything. I’m constantly learning. So as I learn new things and find new resources, I’ll update this page as well. It’s important to note that some of the links shared here are affiliate links. Regardless of the commission, I would only recommend products or resources that I truly find valuable! When I first considered starting a blog I reached out to a friend who already had a successful blog and one of the tips she gave me that really resonated with me was to choose a name that really fit what your blog is going to be about. Take some time to really consider the options for your blog name. I used Hover.com to check available domain names and eventually register my domain name. If you register for hosting through Bluehost, you’ll get a free domain name. I definitely recommend going that route because domain names can get pricey depending on how popular the keywords are in the name (I paid $30 to register my domain three years ago). I highly recommend self-hosting your blog. What that means is you will pay a company a monthly fee to host your blog for you. This will give you much more control over your site. Free services like blogspot and wordpress.com limit your options and functionality. When you are self hosted you are able to customize your website to your liking. If you are serious about blogging, self host and create the professional website you want. I share very simple step by step instructions for setting up your blog through Bluehost. It’s really very easy! Blog design can be EXPENSIVE. If you are interested in saving money and want to give a go at DIYing your own blog design you can do it easily with some resources! As I mentioned, one of the perks of being self hosted is that you have complete creative control when it comes to the design of your blog. One thing about being self hosted is that in the beginning your site is basically naked. You have to use themes, widgets, and plug ins (you’ll learn those terms quickly, I promise) to create the beautiful site you see in the blogosphere. My site runs on the Genesis Framework. I’ve had it since day one on my blog it makes designing the blog SO easy! It’s a great investment if you are interested in blogging for real. They offer “child themes” which quickly take your site from “naked” to “dressed up” in a few simple steps. When I first started my blog, I began with the Craftiness child theme created by Restored 316 Designs. I purchased it for an additional $30 I believe and then created a header/logo to match. You can see here the evolution of MHB logos. When I first went live my header/logo was the one of the bottom left. I created it using PicMonkey.com for absolutely free. PicMonkey is a user friendly website that allows you to edit photos and create graphics very easily. They have a free version and a paid version (the Royale version is $33/year and offers way more options). After about a month of blogging I wanted a more professional look for my site so I found a graphic designer on Etsy.com to create a header/logo for me. She created the top logo for $50. It felt like a pricey investment at the time but it was definitely worth it to me to have a more professional look. I kept that header/logo for about a year before getting my first website design. I had a graphic designer create a website design for me after I had been blogging a little over a year. That included a header/logo (bottom middle), custom signature, custom sidebar menu, custom fonts and colors, and a few other details. Another year later, I was finally getting my bearings when it came to creating graphics of my own so when I was ready for a site “facelift” I attempted it on my own. I switched themes (I currently use the Graceful theme from Restored 316 Designs) and created my own logo using PicMonkey (bottom right). So, once you’re set up with Genesis and a child theme, it is SO easy to customize your site to your taste. Now that your blog is set up here are some other resources I use that you might like to try. Building a Framework – Literally the moment you decide you want to start blogging you should purchase this ebook. Written by a blogger, it will walk you through everything from set up, to how to make money blogging. Want to know what strategy others are using for social media? It’s covered. Want to know how to work with brands? It’s covered. Want to know how to make money? It’s covered! I’m telling you, when I began blogging three years ago, there wasn’t a resource out there that truly covered all basis – this DOES. MailChimp – any expert will tell you to start building your list right away. If I had one thing I wish I did from the beginning it would be an email list. Having that direct link to your readers is so valuable. Social media changes all the time – email is the one thing you can count on when trying to reach your readers. I use MailChimp to provide posts straight to the inbox of my readers as well as for my monthly newsletter. The accounts are tiered. If you are just starting out or have less than 2,000 subscribers it’s completely free. Once you surpass the 2,000 subscribers you’ll start paying a monthly fee that grows as your list grows. The Blog Planner – One thing that I think surprises most people is how time consuming blogging can be. Brainstorming projects, working on projects, photographing projects, writing about projects all takes up valuable time. When I first started blogging I used a desk calendar to try to keep my ducks in a row. As my blog grew I realized I needed a comprehensive planner that could be dedicated to my blog. I’ve been through multiple (expensive) planners including The Life Planner and the Day Designer but The Blog Planner has been the only thing that truly keeps me organized. My friend Corey from Tinysidekick.com created this planner last year and I’ve been using it since it was released. Tailwind – Pinterest drives a good portion of traffic to my blog. In order to capitalize on that I use a pin scheduler to optimize my pinning strategy. That strategy changes quite often as social media is very fluid but Abby talks about great tips in Building A Framework. I use Tailwind as my preferred pin scheduler. It’s fairly inexpensive, gives great information in the form of analytics, and it’s highly effective. Canva – I previously mentioned PicMonkey.com as a source for creating graphics to use on your site. Another great resource is Canva.com. I’ve been using Canva since it was in Beta mode and it’s grown so much. There are tons of free images and graphics that you can tweak right in their program creating your own one of a kind image for your site. Some images/graphics do have a small fee (like $1 – totally worth it). Adobe Lightroom/Photoshop Elements – So this one is definitely not a requirement as you can do the majority of your photo editing in PicMonkey however, both Lightroom (LR) and Photoshop Elements (PSE) are essentials for me. I decided on PSE instead of full Photoshop because of the cost. PSE was much more affordable for me and it ended up being a great purchase. I love PSE because have much more control (in comparison to PicMonkey or Canva) when creating graphics. It makes creating a mood board or media kit a breeze. LR is amazing for streamlining the photo editing process. You can literally go through dozens of images in a snap instead of editing them one by one. Brilliant Business Moms Podcast – Two gals got together and created a podcast dedicated to getting valuable information to business minded mamas. If you are like me – you don’t have a lot of free time to sit in front of the computer and read about blogging. What I love is that I can download these podcasts and listen to them while I’m cooking dinner or in the morning while I’m working on projects. They interview “momprenuers” about different topics such as, growing your blog, networking, SEO, etc. In addition to their momprenuer interviews they offer other valuable posts on their website. Camera – Canon Rebel DSLR – Blogging is very visual. You want your photos to catch someone eye on google or Pinterest or whatever social media they might be searching. Having the ability to create clear and beautiful photos is almost a requirement when it comes to blogging. I have now have the Canon 6D. It was an upgrade from the Canon Rebel which I would categorize as a beginner DSLR. When I first started blogging I purchased an additional lens to go with my camera, the Canon 50mm 1.8. It’s also known as the nifty fifty. I think just about every blogger I know has one. It’s perfect for getting that nice blurry background or bokeh. It’s super affordable at just over $100. Last year I added the Tamron 28-75 2.8 and the Canon 50mm 1.4 to my camera bag and both of these are my go to lenses for blog photography. They are not cheap – but the Tamron allows for a wider angle shots while the 50mm is better for close up shots.